How Drexel poet Harriet Millan found herself inside the saga of one Sudanese refugee. The story of how Drexel poet Harriet Millan helped Sudanese refugee Michael Kuch reunite with his lost mother — and in doing so, find herself. Under a clear Australian sky, Michael Majok Kuch stood patiently waiting to reunite with his mother. 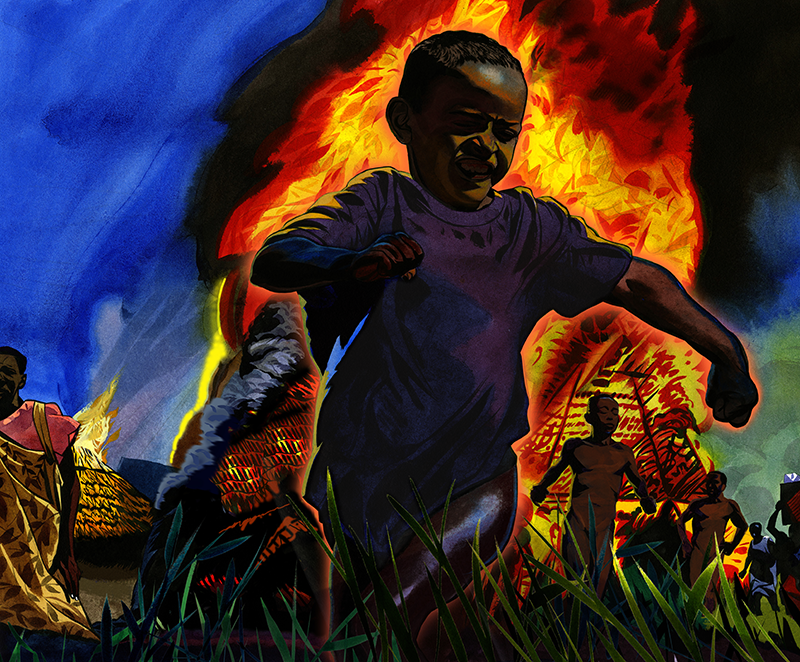 It was July 2008, and it had been two decades since he had last seen her — since he fled his burning village in southern Sudan in the middle of the night as flashes of light pierced the clouded air, his childhood suspended by a civil war he was too young to understand. Just 5 years old, he dodged death on a harrowing journey through refugee camps and across borders, on a path that brought him to the United States and to a new life. But no matter how many miles he traveled, no matter which direction he turned, he had always been facing toward this moment. Despite the weight of it all, Kuch felt at peace as he peered over the wooden fence outside the home where his mother, separated from her children and seeking safety from the same war, had eventually resettled. From a remove, Harriet Levin Millan watched, feeling like a mother herself. A poet and creative writing professor in Drexel University’s College of Arts and Sciences, Millan had been introduced to Kuch earlier that year through a cultural reading program organized by the City of Philadelphia. Initially, Millan’s task was to write a short biography of Kuch for publication in a local paper that was collaborating with the program, but as she listened to his story, she wanted to do more. She had helped orchestrate this reunion. Kuch was about to close a painful chapter in a life interrupted by conflict and loss. For Millan, though, this was a beginning. She would later say that meeting Kuch jolted her awake, opening her eyes to the power of writing to effect social change. “I saw how I could draw on my teaching job to help change the world,” she says. In the years that followed, she created a program called the Reunion Project to raise funds to reunite other child refugees with their families. She reimagined her writing, her teaching and her role in the world. She learned, through Kuch, that a deep reserve of empathy is the greatest tool of a writer and a citizen alike. At Kuch’s insistence and with his guidance, she began to write a book about his life and, in the process, change her own. Kuch believes that if he and Millan can connect emotionally with readers through art, they can shine a light on the conflicts impacting displaced people. South Sudan achieved independence in 2011, but statehood hasn’t protected the country from famine or ethnic violence. Nearly half a million South Sudanese have fled to Uganda in the past year alone, and aid agencies warn that millions are in need of assistance. Millan’s book about Kuch’s escape from Sudan, “How Fast Can You Run” (Harvard Square Editions) was published last fall, but its genesis began eight years earlier on a snowy day in January 2008, when Millan went to a West Philadelphia coffee shop to meet Kuch for the first time. She had been given his name by the organizers of “One Book, One Philadelphia,” an annual citywide book club that had chosen Dave Eggers’ “What Is the What,” about the Lost Boys of Sudan, as its topic of discussion for 2008. The organizers had asked Millan if she, as director of Drexel’s University Writing Program, knew students who could help Sudanese refugees living in Philadelphia share their experiences, much like Eggers had recorded the story of Valentino Achak Deng’s escape from Sudan and eventual resettlement in America. The students’ writing would later be published in Philadelphia City Paper. Millan instantly agreed to pair 10 refugees with students from her Peer Reader Training class at Drexel. She had been teaching her students Paolo Friere’s “Pedagogy of the Oppressed,” a book that explores the relationships between students and teachers in an imbalanced society, and she was sure they could handle the emotional assignment. A few days before meeting Kuch, Millan had been in the same coffee shop, darting among her 19-year-old students, quick with hugs for some who wept while listening to their partners’ stories. The death and devastation the refugees had experienced in Sudan couldn’t have been more removed from the open, urban lives the students were living, and they felt its impact. For Deborah Yarchun ’08, a screenwriting and playwriting student at the time, meeting Garelnabi Abusikin, a refugee from Darfur, cemented the need to write empathetic, first-person narratives. Millan was inspired to join the writing project herself, and a few days later she was back in the coffee shop, waiting for Kuch. When she first saw him enter, snow settling in his hair and on the black suit he had worn to a nearby speaking engagement at the University of Pennsylvania, she saw the tribal scar on his lower forehead, the first sign of a story waiting to be told. Within 20 minutes Kuch asked if she would help him write a book about his life. Millan, a poet whose prose background included a few desk-drawer novels but nothing published, felt compelled. The following week, Kuch and Millan began a series of intense discussions that continued for more than two years. They met two or three times a week — at her Drexel office or in her home in Bryn Mawr, in coffee shops, at his East Falls apartment on Midvale Avenue. For hours at a time they sat, shoulder to shoulder, recording Kuch’s history on tape as the afternoons turned to dusk. As the two became more comfortable with each other, the conversations moved deliberately through Kuch’s life. There was the night, when he was 5, when he ran away from armed men ransacking his village in search of a freedom fighter targeted by the Sudanese government. There were the hundreds of miles he wandered around eastern Africa, separated from family, hungry and thirsty and surrounded by threats. There were refugee camps in Ethiopia and Kenya. There was the revelation, when he was 17 and had been living in camps nearly all his life, that he had received political asylum in the United States, along with 3,800 other unaccompanied minors who came to be known in the media as the Lost Boys. Then came his arrival in Philadelphia, in 2000, his time at LaSalle College High School and the academic and soccer scholarship he earned to get a bachelor’s in political science at Chestnut Hill College. By the time he met Millan, he was working toward a master’s in international politics and conflict resolution, which he finished in 2010. The conversations about his journey, both before and after arriving in Philadelphia, were often painful, emotional outpourings, but the book would have been hollow without his darkest moments. The wound is still there. It has closed over in time and formed a keloid, the skin a little shinier and darker than the skin around it. In a different story it would be gone completely. But this is not that story. Millan discovered a deep personal connection to Kuch’s story. As a Jew, she saw parallels between his life and those of her grandparents, who escaped pogroms in Eastern Europe. They, too, had their homes burned and were forced to leave everything behind for new lives. They, too, had to persist. “He had their optimism,” she says. Much of her grandparents’ history is unfortunately lost to her, she says. Even simple details such as family names and hometowns are missing. Hearing Kuch open up felt like a window into their lives. For Kuch, sharing his life’s narrative is an urgent response to the frustrating silence surrounding his people and his homeland. He sometimes feels that Americans can’t be bothered to train their attention on refugees and the conflicts that create them. When the project began, he saw the book as a chance to increase pressure on the Sudanese government to end the country’s civil war, which began in 1983. Nearly 2 million Sudanese, mostly civilians, died as a result of the war, and more than 4 million were forced to flee their homes — most of them, like Kuch, landing in internally displaced person camps. Of those, at least 20,000 were children separated from their families, thousands of whom, like Kuch, came to America in the Lost Boys resettlement program. The war officially ended with a 2005 peace deal, but that peace has been fragile, including in the years since South Sudan gained independence in 2011. Kuch sparked a shift in Millan. She was a self-described white college professor with a middle-class upbringing, living in an affluent suburban neighborhood, but as she learned more about Kuch and his community, she began to change. He never stopped believing that his mother connected with him through other women. She didn’t stand before him, but she manifested herself through others. Maybe. Just maybe. She began spending time with other refugees and members of the Sudanese community living in Philadelphia, discussing famine and conflict in Sudan and ways to help. Together, she and Kuch began raising money to help reunite other divided families. They formed the Reunion Project as part of the Philadelphia-based nonprofit Global Education Motivators, which had been working with Kuch as he shared his story at speaking engagements, and the funds began coming together. Drexel’s writing program organized a read-a-thon, in which students took $10 pledges to read books from a list of 100 works focused on the crisis in Sudan. The University hosted a “Jam Against Genocide” benefit concert. Millan’s son, Josh, organized an Oxfam hunger banquet at Harriton High School, where he was a junior. In all, the efforts raised $15,000, enough to reunite three of Kuch’s fellow unaccompanied minors — and Kuch himself — with their families. The experience permanently altered Millan’s teaching style. After the devastating 2010 earthquake in Haiti, Millan organized a benefit for victims, bringing Haitian author Beaudelaine Pierre to campus for a reading. After she began teaching Pierre’s disaster-inspired anthology, “How to Write an Earthquake,” she decided it was time to take her students to Haiti for a study-abroad trip with a service component. This summer, along with Drexel Study Abroad Associate Director Ahaji Schreffler, she’ll take her fifth group of students to the island for a Drexel “Summer Break in Haiti” creative writing intensive that blends community service at a local orphanage with cultural exchange through writing. While there, the students also meet Haitian poets and authors and join them in writing workshops. Millan is working to translate and publish poetry from some of the writers she has met in Haiti to give them greater exposure outside of their country. On the book tour for “How Fast Can You Run,” which began last September and has dates planned into the fall, Millan visited Pittsburgh’s City of Asylum, a writing community that provides sanctuary for endangered authors and hosts exiled writers in residence. She began designing a collaboration with the organization in which writers in asylum will come to Drexel and her students will go to Pittsburgh to live with the writers for a weekend to work together on a writing project. Millan takes students to Haiti annually on a writing intensive experience that includes time spent at Love Orphanage, pictured here. Students who make the trip are asked to raise money for the children, which has helped the orphanage buy a van, laptops and clothes. It has also helped to pay the $250 annual fee to keep each of the children in school. She pushes her students to look beyond preconceived limitations on their lives and their art, to overcome the space between people. Kuch found a deep connection with Millan through this idea, the desire to make his people and their challenges known. He wants the book to do for readers what writing it did for her: make them aware, make them want to help, wake them up. And there may be more books in his future. In 2010, Kuch returned to Sudan as talks of independence grew. The following year, South Sudan officially became the youngest country in the world, and he is now an adviser to its president, as the government’s director of research and policy. He hopes to write a biography of President Salva Kiir Mayardit, and maybe other books. He wants to put into practice all the lessons he learned while working with Millan. Millan, whose poetry took a backseat over the years she and Kuch worked on “How Fast Can You Run,” is eager to write another novel. She’s been hooked by the techniques of fiction writing and the way it expands the possibilities of her art. It allows her to build on what she knows best. “How Fast Can You Run,” the novelization of Kuch’s life story, is unmistakably written by a poet. It brims with scents and sounds, village life made tactile, the natural world as a crucible for a boy growing into himself. There’s a lightness of spirit throughout — not levity, but something indomitable and true. Kuch wanted the book to communicate his resilience. It was what kept him walking through the night on his way to refugee camps, suppressing hunger and weakness for the chance at a measure of peace. When Millan first met Kuch, he told her he could sense a curtain around him. He was living a good life, far removed from the struggles of his youth, but without his family he said he felt incomplete. Though Millan helped to raise the money to send Kuch to Australia, she hadn’t considered joining him until he suggested it. “When we talked about being separated from my mother, she couldn’t help but be there and experience that joy as we reunited as a family,” he says. The moment, when it finally came, was “breathtaking, like nothing I’d ever experienced,” Millan recalls. Kuch waited, hands in pockets, as his sister ran to open the gate and wrap him in a hug. His mother quickly joined, then his brother, and after so long apart he was once again clothed in the embrace of family, overcome with emotion. After 20 years of wandering in the dark, wondering if he would ever find his mother, his journey was over. The curtain lifted and he could see clearly. For Millan, whose eyes he had opened, the same was true. Now, she feels, she has her answer. An article of such stunning depth, Mr. Seal, that I wept while reading it. Harriet, your work inspires, and I’m richer for knowing about your journey with Michael Kuch, and the one you continue to make toward yourself.